These days, more and more of us turn to DIY instead of hiring a professional to do the odd jobs around the house. Doing it yourself can save you lots of money, but it’s important to have the right tools for the job. If you’ve got a painting job on your hands and want to find the best paint brushes for it, read on. I’ve put together a handy guide on the perfect brush for any job you could think of. Why Do Different Paint Jobs Need Different Brushes? Which Paint Tasks Are Best Suited To Brushes? Doing work yourself doesn’t mean that you have to compromise on quality. Each painting job you do will require different tools. Many people think that DIY means using whatever you have around the house to get something done quickly. In fact, there are tools designed for pretty much every paint job you can imagine and it’s well worth doing some research into them. If you’re looking for the best chalk paintbrush, your needs are going to be very different to those of someone searching for a brush for acrylic paints. While you can buy multi-tasking paint brushes, I’d suggest investing in something specifically designed for the project you’re undertaking. There are many different types of paint brushes available, all created to suit specific paint jobs. The brush you will need depends on how big the area you’re painting is, as well as what style of painting you’re going for. If you’re after the best brush for painting trim, you’ll obviously want something different to a brush designed for larger areas. The paint that you will be using will also massively affect what brush you should be going for! It is well worth planning everything out before you hit the hardware store, as it can be easy to get carried away once you’re there. Make sure your brush complements the paint you’ve chosen, or you’ll end up paying double the money to get someone to come and fix your mistakes for you! Some jobs may require spray guns instead of paint brushes. These tend to be bigger areas that would take a long time to paint by hand. If you’re tackling a large wall or outdoor area that needs to be painted quickly, a spray gun could be just the thing for you. Alternatively, you may want to go for spray paint cans instead. Again, these can be great for getting things done more quickly. That said, they don’t tend to have as much reach as spray guns, so I wouldn’t suggest using them for big projects. They offer a slightly different finish to spray guns, but this isn’t normally too noticeable on smaller projects. Brushes are best kept to smaller pieces of work. Painting a whole, large wall with a paintbrush can be somewhat time-consuming and you’ll end up very bored and with a dead arm. Use paint brushes for finer work, such as the trim or edge areas, any decorative pieces or work that is hard to reach with a spray can or gun. You can paint medium-sized areas with a paintbrush if you choose to, which takes more time than using a spray gun but gives you more control. Anyone who tends to get a little bit overexcited with a spray gun should stick to very large areas where it won’t matter too much if you’re not overly neat at the beginning! If you’re going for a mural or something more detailed, paint brushes are a perfect choice. prefer using brushes anyway, as they give a more personal touch to the work and I feel more in control of what I’m doing. In short, yes! The size of your brush and its bristles will really affect the quality of your work. Most hardware stores stock a huge range of brushes, but the brush-width will only really vary within the range of one and five inches. It is worth measuring the area you are painting before you head to the store. The size of the bristle you need to look for depends on the size of the area you want to paint. Larger-width bristles work for block areas. If you’re painting by hand, pay attention to how much space you’ll have for the brush itself. If you’ve got lots of room, go for a big-bristled paintbrush. The best paint brushes for different jobs are listed below, so keep reading. If you’re going to be painting the trim or edges of something, opt for smaller, thinner bristles for a better finish. The smaller the job, the smaller the bristles need to be. Using a large-bristled brush to ‘paint in the corners’ or do any fine pieces of work will not work and will give you a messy result. This really comes down to some common-sense. If you’re painting a narrow area, make sure your brush is thinner than the surface, otherwise, it’ll end up getting quite messy. Equally, feel free to use a wider brush for large areas to speed things up. Of course, if you’re painting a really large area, it’s worth considering using a spray gun if possible. So, you get to the hardware store and instantly feel overwhelmed by the amount of almost-identical brushes. Sound familiar? The brushes may all look the same, but there will be subtle differences between each brand of brush. I’ve listed my top three brands to keep an eye out for. This is a great brand for DIYers of all levels. Purdy offers various ranges of paintbrushes to suit every job. They are reasonably priced, so are more of an investment brush that you need to take care of than a one-job piece of kit! On that note, it’s actually very easy to keep these brushes clean and maintain their high quality. Their range of bristle-widths is great, and they have some brushes measuring half an inch wide. These make great brushes for fine work and any super-detailed jobs you fancy doing around the house or garden. Their brushes are made to last, so make a great addition to any DIYers’ toolbox – the best paint brush brand out there, in my opinion. Hamilton has some great, big brushes for any major projects you want to crack on with. These brushes are fairly cheap but are still made to last a long time. Whether you’re new to the game or have a huge collection of brushes already, this brand is well worth considering for your next buy. Their brushes are very high quality and are well-priced. They have a large range of brushes to choose from, so find something that works for your painting job and enjoy. Hamilton work with professional painters to make sure they’re keeping up with new demands and producing the best possible products. You may not be a pro just yet, but you still deserve the very best. The better the brush, the better the painter. This brand offers some super comfy little brushes for the finer jobs on your list. If you’re fed up of big, clunky handles, look to Wooster for smaller brushes to help you get even closer to your work. They are the best paint brush brand to have in your toolbox if you’re painting narrow or hard-to-reach areas. Wooster brushes are designed for specific jobs, so take the time to really look into their products. They have created brushes to make the most of whatever paint you’re using, and to give you a great, professional-looking finish. Make sure you know what kind of surface you’re painting, as each Wooster brush is tailored to certain surfaces or kinds of job. When it comes to choosing a brush for chalk paint, you’re going to want to keep an eye out for various different features. 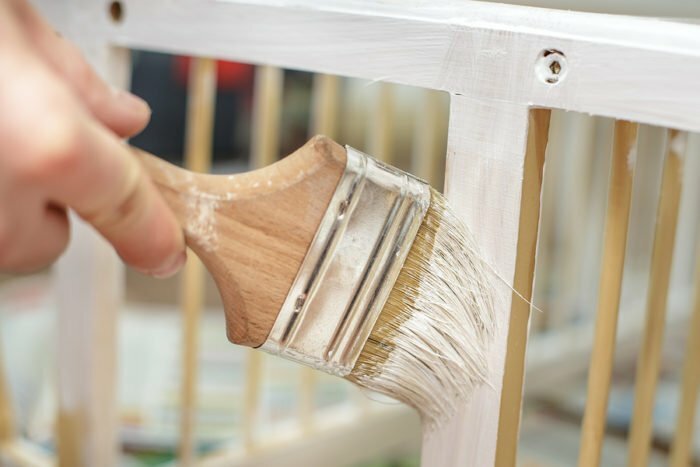 Chalk paint is natural, so it’s recommended to use a natural bristle brush to apply it. Most paint brushes have either natural bristles or synthetic, nylon bristles. The natural bristles will complement the paint and help you apply even, smooth coats to most surfaces. Using natural brushes will really let the quality of your paint shine through. You don’t need to coat it with paint as often as with other brushes, meaning your tin will go a lot further. Happy days all around. You can use synthetic bristles, but the finish won’t look as good. The synthetic bristles will cause the paint to slip off, which will massively affect the quality of your paint job. You are also more likely to get those annoying bristle-lines, which is frustrating and ruins the finish. If possible, I would recommend going for natural bristles. The size and shape of the brush is up to you, really. Think about what you’re going to be painting and go from there. Round-headed brushes are often popular when it comes to chalk paint, but you can also find narrow or slanted brushes if you need to. This brush from Mudder is perfect for using with chalk paint. The bristles are natural and form a round brush head. The brush head measures two inches in diameter, so offers reasonably good coverage per stroke. These bristles hold the paint well so you won’t have to continuously reload your brush. The length of the bristles is almost two and a half inches, which makes it suitable for various surfaces and paint jobs. This allows you to reach any tricky areas as well – while I wouldn’t recommend it for cutting it on large wall areas, it is perfect for getting into corners. It gives great coverage on pretty much any surface, so you can show off your chalk paint all over your home. The handle is made from wood and is designed to be easy to grip. It also has a handy leather tag at the end so you can store it hanging up, or air-dry it. Mudder has used super sturdy bristles, so you don’t need to worry about any falling out mid-paint. In my opinion, this is best paint brush for chalk paint as it will give you a great-looking end product while highlighting the quality of your paint. I love this round-head brush for its simplicity, as it saves on paint-wastage while giving a great, even finish – the best brush for chalk paint. I’m still waiting for anything negative! When it comes to buying a brush for trim work, there are a few things to bear in mind. You’re going to want an angled brush, or two, to help you get into those corners. Ideally, go for a couple of different-sized angled brushes if you have the budget for it. The angled bristles will help you have more control as you paint trim or any other detail-oriented pieces. You can go for square-ended brushes if you prefer, which work well on flat surfaces. Chiselled brushes are another option that works well for corner areas or hard to reach areas. I prefer trim brushes with long handles, as I find it easier to reach smaller spots this way. This is personal preference, however, so find something that feels comfortable for you. This will vary with your hand size, as well as the size of the area that you are painting. Most trim brushes can be used for a variety of paints. For chalk paints, just because they tend to be quite pricey, I would suggest sticking to chalk brushes only. Trim brushes do work with them but I like to play it safe. Trim brushes can be made from a variety of materials, so this is up to you as well. Look for something with good bristle-retention otherwise you’ll end up with a messy paint job. This also means that the brush will be suitable for outdoor work, normally. As I mentioned earlier, I love Purdy paintbrushes. This angled brush is no exception and is a great addition to your toolbox. This brush comes in a variety of sizes, but I like the smaller size for doing trim work with. They have several widths of bristles, ranging from an inch to three inches with various intervals in-between. The handle is long and sturdy, as well as easy to grip. This brush comes in for under $10, which is impressive given how long it will last. This bristles of this brush are made from nylon and polyester, which gives a relatively natural feel. It can be used with any type of paint for a high-quality finish. This is best paint brush for trim – it holds its bristles for a long time and gives you great control while you paint tricky areas. Acrylic paint is lovely to use and gives a great, professional-looking finish. Provided you’re using the correct brush, that is! If you’re using acrylic paint, you probably want something with synthetic bristles. You’ll want to make sure that the entire brush-head is covered in order to get the best coverage possible. Some brands trick you into buying their brushes when the center is actually empty! This means that it takes longer to paint each area – not fun for anyone. Look for something with a decent handle length – whatever you’re choosing to paint, it can be useful to have a long handle. This also means that it’s good for several painting projects. Smaller handles are good for trim work and details but go for something longer and it will double up for lots of work. This brush has nylon and polyester bristles, so works well with acrylic paint. It comes in a variety of sizes so you can find something perfect for whatever job you’re undertaking. The handle is made from plastic. For just over $5, you’re getting a good quality brush designed to last. The bristles are made to stay in the brush-head for a long time, so you should feel confident using this for outdoor jobs as well as indoors. I’ve searched through the best acrylic paint brushes on the market and this is my top pick. This is a great product if you’re going for a medium-sized project. The brush is good enough to use for most projects. I wouldn’t recommend it for use with chalk paint, but other than that, it’s good for a wide range of painting jobs. I like this brush because of the price, for one – it’s hard to find good quality brushes at such low prices – but also for the fact that it’s a multitasker! This obviously depends on the size of the wall you’re painting. Given that you’ve opted for a paintbrush instead of a roller or spray gun, I’m going to assume that the area you’re painting isn’t anything too big! So, when it comes to painting a wall, you have a pretty big range of brushes to choose from. If you’re going for chalk or acrylic paint, follow the guidance above for specific help. If you’re just after a paintbrush in general, I’ve got you covered. You’ll want to something sturdy, as even small walls can take some work to get right. Look for soft bristles in order to get a good finish. This should also help the brush hold the paint a little bit better – you won’t find yourself constantly dipping back into the paint-pot. If you’re going to be painting outside and in hot, humid conditions, look for something with good bristle-retention. Lots of brushes are perfectly safe to use outdoors but may start to shed if they’re used in hot environments, so beware of the dreaded loose bristles in your artwork! I know, I’ve included another Wooster product but I just couldn’t help it. This brush is under $5, which is impressive when you think about how much a decent cup of coffee costs. I’ve chosen the two-inch brush, but there are other options there if you prefer something different. The bristles are a nylon and polyester blend, so work well with most paint types. The plastic handle is actually made to be easily-gripped, which makes a nice change from some of the slippy handles out there! The bristles on this brush are nice and soft – this helps you get an even coverage and a lovely, smooth finish. This brush tends to work somewhat well for cutting in, as well as filling in the main area. Again, this depends on how big the area is. I don’t usually support throwaway-products, but if you’re after something to use for a few small projects, this is a great option. There’s no point spending lots of money if you’re not really into DIY and are just dabbling with a couple of little odd jobs around the home. Getting into DIY can be overwhelming, and there are so many factors to consider before buying any new tool. Hopefully, our buying guide has helped to clear things up a bit for you. There are so many paintbrushes out there that it’s hard to know which one is best for you and whatever job around the home you’re tackling. I’ve suggested some of my favorite paintbrush brands available, as well as offering up reviews of the best products out there. Find something that suits you, whack on some music (‘Eye of The Tiger’ seems to work pretty well in my home) and enjoy finally getting round to that painting job.